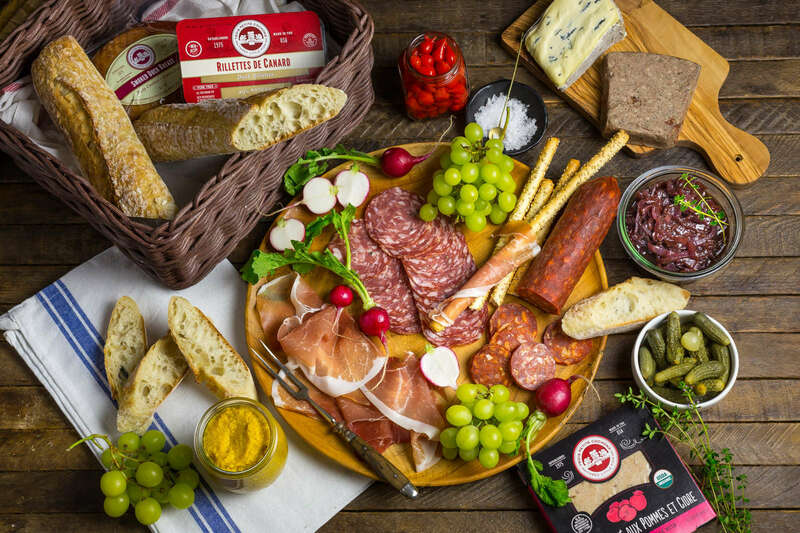 We put the must in mustard, the cute in charcuterie, and the jam in …er … jam, with this spectacular picnic spread. Ham! Cheese! Pâté! Salami! Pickles! Our festive charcuterie board is topped off with fresh, tangy home-made Maple Mustard and sweet Red Onion Jam. This is a sponsored post in collaboration with Les Trois Petits Cochons. Thank you for supporting Nerds with Knives’ partners! There’s something about a picnic that pulls at the heartstrings. As a concept, it’s hard to beat – put tasty snacks into a bag? Carry the bag into a field, perhaps by a lake? Lie down on a blanket and eat the snacks and look at the view and drink wine? WHAT IS BETTER THAN THAT. (Nothing. Nothing is better than that.) And its alliterative name, like odds and sods, and bits and bobs, suggests that really, you can take any collection of tasty foods and a cold bottle of something delicious, and you can’t go too far wrong. (Just make sure you have home-made Scotch eggs on your charcuterie board. Seriously.) Then, a few years ago, we had a holiday in France, and realized that the French really have this whole picnic idea down. 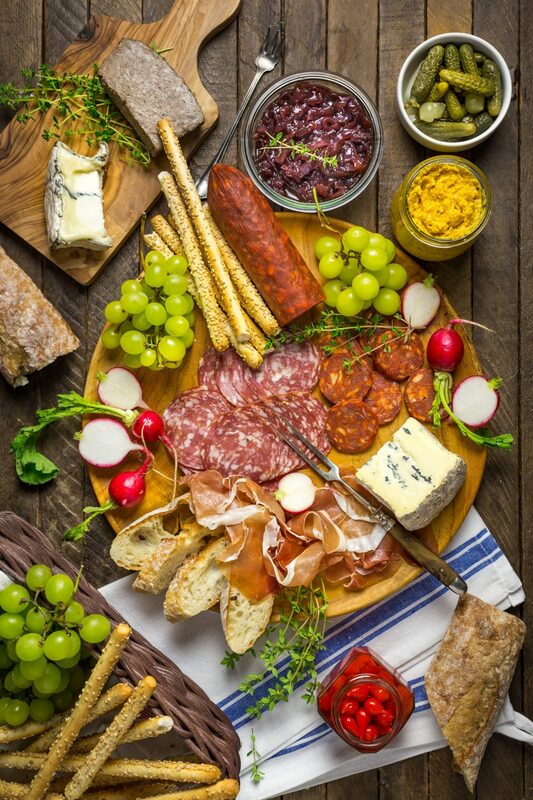 We like a variety of flavors and textures in a charcuterie board – check out our tips below! It was certainly an accident of fate that, once in France, we ended up taking pretty much every lunch en plein air. We had a planned route to drive around the south east of the country, hopping from one small town to another through bucolic fields of sunflowers and grape vines, dairy farms and purple heathered hills scattered with scree and goats. Being unfamiliar with the country, we assumed a GPS would be able tell us how long it would take to get from point A to point B. Hahahaha. It turns out that the speed limit in most of rural France is 90 km/hr (about 60 mph). However! Just because you legally can drive a mountain road at 90 kph, doesn’t necessarily mean you should, despite what your judgmental GPS may tell you. The way up is windy, and the hills are often foggy, and you may need to stop every few seconds to shoo a goat off the road. That meant we often ended up arriving at a lunch spot way past the hour of 2pm, at which point every restaurant in France shuts down with an indifferent shrug and a muttered “bof”. No crepes for us. So we quickly learned to start every morning by stocking up goodies from the local charcuterie – great cheeses, saucissons, pâté, bread, and the best wine you could ever hope to find for just a few Euros. (Though we also soon realized that we didn’t have the vital tool we needed to cut up all these treats – a travel knife, or couteau. Luckily every charcuterie, gas station and newspaper shop sells a selection of them). And so from that point, we were no longer bound so much by our schedule. We would drive around the mountain towns with our picnic goodies, stop when we got hungry (there were many scenic lay-bys with picnic tables to choose from), spread out our collection, open a bottle of wine and watch the sheep wander by. Homemade Red Onion Jam with Wine, Honey and Thyme is particularly delicious with pâté and cheese. This is our attempt to recreate some of those charcuterie-based picnic lunches. Below, we’ve put together some tips you can follow which will help you make your own spread delicious, beautiful and fun, whether it’s for a picnic, party or date night. And while you certainly don’t have to make our Home-Made Maple Mustard and Red Onion Jam with Wine, Honey and Thyme, it will certainly make your charcuterie board tastier! Delicious charcuterie from Les Trois Petits Cochons. A quick note about Nerds with Knives sponsorships. Matt and I are very serious about only recommending products we truly love, and I can honestly say Les Trois Petits Cochons makes some of the best charcuterie we have ever had, either in the U.S. or France. Everything we tasted was delicious, but we especially loved the Jambon Sec, which has a delicate, almost sweet flavor. We also loved that it wasn’t overly salty, the way some cured hams can be. We were also blown away by the Chicken Pâté with Apples and Cider, which also happens to be organic, an added bonus. We absolutely plan on ordering from them again soon. 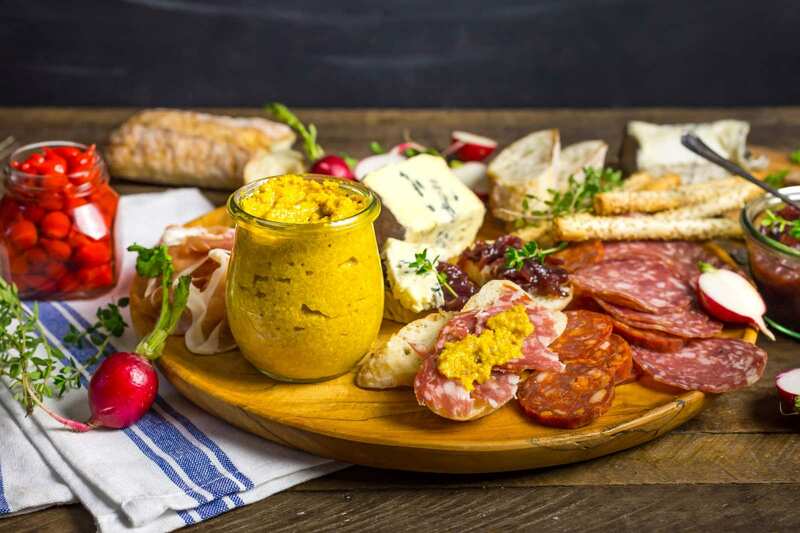 Homemade Maple Mustard goes well with ham, salami and any charcuterie. Choose a variety of meats — We like to go with at least three for a simple board, adding more options as the guest list grows. You’ll want to mix up the flavors: something a little sweet, something spicy, something delicate. Our favorites are thinly sliced dried salami, like Saucisson Sec. This air-dried sausage is savory and almost a little briny. We like it sliced thin so it almost melts in the mouth. Chorizo is a great spicy option. Its bright red color and bold flavor livens things up. We like to buy a whole log so we can slice it a little thicker than the saucisson. Our other must-have is cured ham, like Prosciutto or Jambon Sec. Sliced paper-thin, this delicate, almost sweet ham is rimmed with a thin sliver of meltingly tender fat. Separate each slice and drape it gently onto your board for the most beautiful presentation. Mix up your flavors as you add more options — maybe a sausage flavored with porcini mushrooms (Saucisson Sec Aux Cépes) or thinly sliced smoked duck breast. Add a Pâté or Mousse — Pâtés can be coarse or smooth, and are often made with duck, goose, chicken or pork liver. These rich slabs are usually flavored with wine or cognac and sometimes truffles. They have an earthy flavor that is both robust and delicate. Mousses are made with similar ingredients but are even smoother, lighter and airier. Both pâté and mousse are wonderful paired with spicy mustard and tart pickles. Choose a few cheeses — No, this isn’t a cheese board but even so, a few cheeses will complement your charcuterie choices. We like at least two or three, with a variety of mild to bold flavors. Cambozola is always a crowd pleaser. It’s a Brie-style pasteurized cow’s milk cheese with just a hint of blue veining. Another great choice is a lightly-aged goat cheese, like Humboldt Fog. Its tangy flavor and slight minerality complements the aged sausages. A hard cheese, like Parmigiano-Reggiano or a well-aged cheddar would be a great third choice. Hard cheeses should be broken up into bite sized chunks, rather than sliced, in order to preserve the crunchy texture. Jams, preserves, chutneys, mustards and pickles — store-bought jams are fine (we like slightly less sweet ones, like red currant or fig), but homemade Red Onion Jam with Wine, Honey and Thyme is easy to make and it’s a stellar accompaniment to meat, cheese and pâté. This stuff is addictive. If we have time, we also like to make our own Maple Mustard. Yes, you can buy mustard at any store but this homemade version is in another league entirely. It’s bright and fiery and just a little sweet. We sometimes make our own pickled vegetables but little French cornichons are a classic accompaniment for a reason: they’re awesome. Tiny, bright red teardrop peppers are also a fun pairing. Use your favorites — pepperoncini, pickled jalapeños, really anything briny and sharp is going to work. Fresh fruit and vegetables — We like to keep these simple and seasonal. Fresh grapes (either red or green) are usually good year-round. If you can find fresh figs, great, though apricots and other stone-fruits are good too. In Fall and Winter, sliced apples, pears and quince are great options, especially during the holidays. Dried fruit, as long as they’re not too leathery, are fine additions. The one variety of fruit we don’t recommend is high-acid types like citrus, kiwi and pineapple. These are more of an issue for cheese than charcuterie but their assertive flavors can make cheese taste acrid and curdled. Vegetables are great for texture and color. Our favorites are fresh radishes, endive, and thinly sliced fennel. Bread and Crackers — Crusty baguette, sliced diagonally on a sharp angle is ideal for charcuterie. Breadsticks and crackers are also fine choices but avoid ones that are highly flavored (especially garlic and onion-flavored varieties). The meat and cheeses on your board have delicate, subtle flavors that can be masked or overwhelmed. If you like texture, stick with sesame or poppy seeds which are fairly neutral. A few miscellaneous extras — Roasted nuts, vegetable terrines and dips like caponata or tapenade can fill things out nicely. Olives are always welcome, though remember that there are a lot of salty flavors on the table already. Compound butter and flavored olive oils are nice for spreading and dipping. Varieties of honey (plain, or flavored with things like truffles) are nice to drizzle over certain cheeses (brie, camembert, and Percorino Romano come to mind). Wine and Beer — Red, white and rosé wine are all appropriate to serve. We like to have a variety since spicy, bold flavors pair well with red wind and lighter, more delicate flavors go better with white and rosé. Choose a light to medium-bodied red wine with a hint of earthy aromas and a balanced fruit-forward bouquet. For white, a light-bodied dry wine that’s crisp and refreshing is a good bet. Lambruscos are a good bubbly option with medium acidity. Beer is also a great pairing. Choose medium-bodied beers such as an Ale, IPA or Bock Beer. Aesthetics and Amounts — You can typically plan on 2 to 3 ounces of cheese and charcuterie per person for a cocktail party. Cheese and charcuterie are best served at room temperature so take everything out of the refrigerator one or two hours before your guests arrive. The products are the star, so I like to keep the look of my boards simple and rustic. Wood boards are my favorite, though a big marble slab is also nice. I stay away from silver or metal which can look too formal for this type of spread. I like to group things together in large bunches (for example, a big array of salamis and ham on one side, next to sliced bread and breadsticks, then a few radishes, some grapes etc). This can keep the board from looking too chaotic and hodgepodge. You want the board to look full but not so crowded that people are afraid to dig in out of fear of a structural collapse. Plan on a separate knife for each cheese (to prevent mixing flavors) and little forks for pickles and spreaders for jam. Olives, nuts and pickles can be placed in little bowls or added straight onto the board in mounds. Homemade Maple Mustard adds spicy freshness. Don’t forget your couteau and bon appétit! No, I didn’t make it. But I have to comment. I’ve been reading this blog for about a week (I have a hobby of reading about what I call “fancy food” on my phone while eating whatever microwaved stuff I’m having for dinner) and I am in love with the food and the writing. Emphasis on the writing. I adore the humor and the nerdiness. I’ve visited a fair share of food blogs but this one my favorite, and I just wanted to say thank you. My imagination tastes great things on this blog.